This latest offering from James Lee Burke is a little different from the violent crime sagas we usually get from the venerable wordsmith, but I thoroughly enjoyed his White Doves at Morning (2002) which is also not the usual Burke fare (I dearly enjoy and have followed the usual Burke fare for decades), so I thought I’d likely enjoy this one. I also have a very deep soft spot for the slow southern drawl of Will Patton – a double bonus for me! Weldon Holland is about 15 years old when the story opens, living on a very small ranch in Texas during the Great Depression. He lives with his grandparents and mother who is having some mental issues. A memorable event is the encounter with Bonnie and Clyde. These events resonate throughout the novel. In the next section Weldon is fighting in the last days of WWII and meets Rosita, a young Jewish woman in a refugee camp. Along with a younger soldier named Herschel Pine the three survive but get separated. Later Weldon finds Rosita and brings her back to Texas as his wife – Herschel marries the blonde, teenage Linda Gail when they get there. Texas is the home of the Alamo, tamales and pralines as well as racism, violence as a way of life, and in some ways not much different from southern Louisiana. 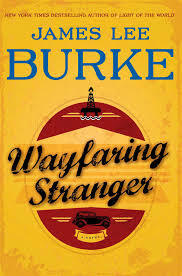 For the most part, the story takes place in the 1950s so it’s an historical novel, but it’s obviously from a 21st century point of view and Burke’s ongoing theme of the reality and presence of evil is timeless. But the historical aspect sets the book apart in other ways because although the details are fun, trains and phone booths, and WWII plays an ongoing role in the background, the other general issues can be read about in the US media today, undocumented aliens, feminist issues, terrorism, even environmental issues, and Burke seems to be making Robicheaux-like statements about them all. In Texas the two young men use what Herschel has developed in the military to go into the oil pipeline and welding business. They make quite a lot of money from Herschel’s technological know-how and Weldon’s business sense. This brings a whole lot of opportunities along with temptations and very sleazy characters – straight Dave Robicheaux. As usual, the good guys are really good and the bad guys are really bad – downright evil in some cases; they are often very rich and their daddy is richer and in some cases even more evil. There’s not much moral ambiguity in a Burke novel – but then, there are probably too many books like that out there already. Burke’s fun if you can take the in-your-face graphic violence, the high literary styling and the complex plots. Highly recommended!